Where: Fred Bramlage Coliseum, Manhattan, Kan.
Last Time Out: Kansas defeated Texas Tech 79-63; Kansas State handled Oklahoma State 75-57. It’s rare for a Bill Self-coached team to find itself in this position, but the Jayhawks still haven’t figured out how to win on the road. 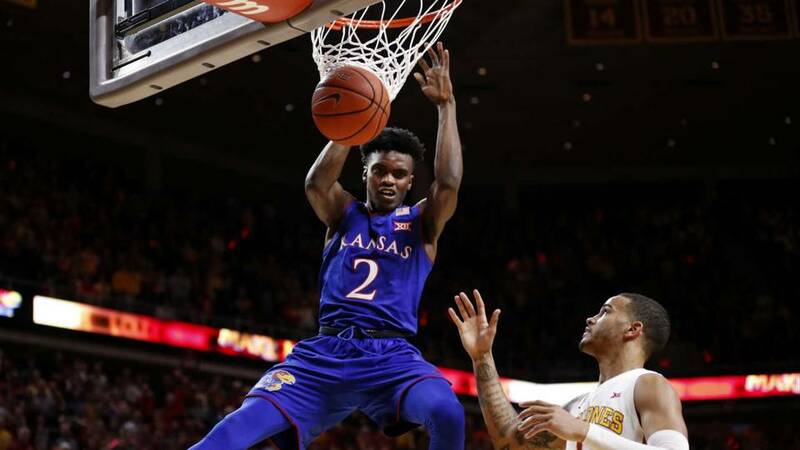 Kansas is 1-5 this year in true road games, falling to Arizona State, Texas, Iowa State, Kentucky and even West Virginia, the last of which is already a complete no-hoper as far as the NCAA tournament goes. That’s not the kind of road performance that gets you either a high seed in the NCAAs or a Big 12 championship, both of which are in jeopardy for the Jayhawks unless they figure out how to win away from Allen Fieldhouse in a hurry. The mood in Manhattan is simple: if not now, when? Never before has the Big 12 seemed so within reach for Kansas State, and the Wildcats seem to have hit their stride in the league, having won six straight to move a half-game ahead of the Jayhawks in the league. Kansas State put everything together on Saturday against Oklahoma State, nearly handing the Cowboys their worst home loss ever before backing off with the game well in hand. Even with a late Oklahoma State run, the Cowboys became the 14th straight team to fail to break 70 points against K-State, which nobody besides Marquette has done this season. History. The Sunflower Showdown was once one of the most competitive rivalries in college basketball, on par with Duke and North Carolina. Those days are long gone now, as Kansas’ blue shadow has extended over the state for the past three decades. The current streak is at eight consecutive wins for the Jayhawks, and it hasn’t mattered a bit whether the game is played in Lawrence, Kansas City or even Manhattan. Since Bramlage Coliseum opened in 1988, the Jayhawks boast a 26-4 record against K-State in Manhattan. K-State coach Bruce Weber pointed out his team’s futility against its in-state rivalry by reminding his players that none of them have ever beaten Kansas, and whether the Wildcats use that as motivational fuel or the history hangs over their heads will go a long way in deciding this contest. The Jayhawks stay composed. Unlike Arizona State, Kansas State is not going to try to out-athlete Kansas. Unlike Texas, K-State isn’t going to try to beat Kansas at the free throw line either. What K-State will try to do is force the Jayhawks out of their comfort zone and hope to win the battle of mental mistakes. What the Jayhawks need to do in response is remember that they’re in a building where they’ve had a lot of success over the years and stay composed. By the same token that nobody is wearing a Kansas State uniform Tuesday has ever beaten Kansas, nobody wearing blue has ever lost at Bramlage Coliseum. Self needs to make sure his players are comfortable and confident in the Octagon in order to get a result. The Wildcats can deny Kansas good looks at the basket. Kansas has three significant weaknesses: they’re prone to foul trouble, they don’t have the depth to handle a track meet with their opponents, and they’ve been known to make bad decisions when they get flustered. Unfortunately for the Wildcats, playing fast isn’t in their DNA, they aren’t great free throw shooters, and they don’t have much more depth than the Jayhawks do. So K-State’s going to have to win this game with its biggest strength: its defense. The Wildcats are excellent at forcing their opponents to slow down and frustrating them into making the wrong decision, and they’ll have to do that effectively all night to take advantage of the one Kansas weakness that they can successfully exploit without getting away from their strategy. Picking against Kansas is seldom a good way to make money, especially when the Jayhawks are playing anywhere in the Sunflower State, but this feels like it’s Kansas State’s time. The Wildcats do make me nervous given their occasional disappearing act on offense, but Kansas State plays better defense than Kansas, and the Jayhawks still haven’t proven that they can get the job done away from Allen Fieldhouse without Udoka Azubuike. I hate the idea of picking against Kansas in its home away from home. That said, until the Jayhawks prove that they can win more than one “true” road game, I’m going to go with the home team, especially when the Powercats have won six in a row in the Big 12 and are coming at such a cheap price, giving only 2.5 to Kansas. Give me K-State to take control of the Big 12 with a home victory.